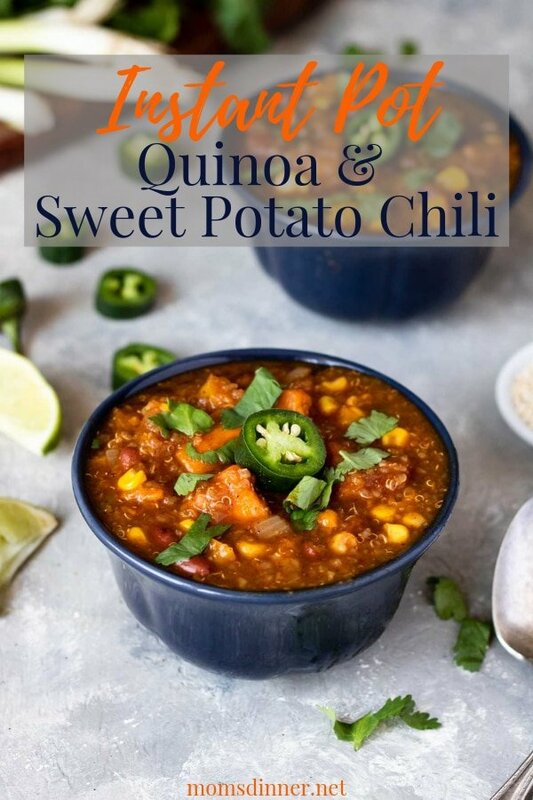 Instant Pot Quinoa Sweet Potato Chili is such a flavorful and unique chili recipe that you will not even miss the beef. 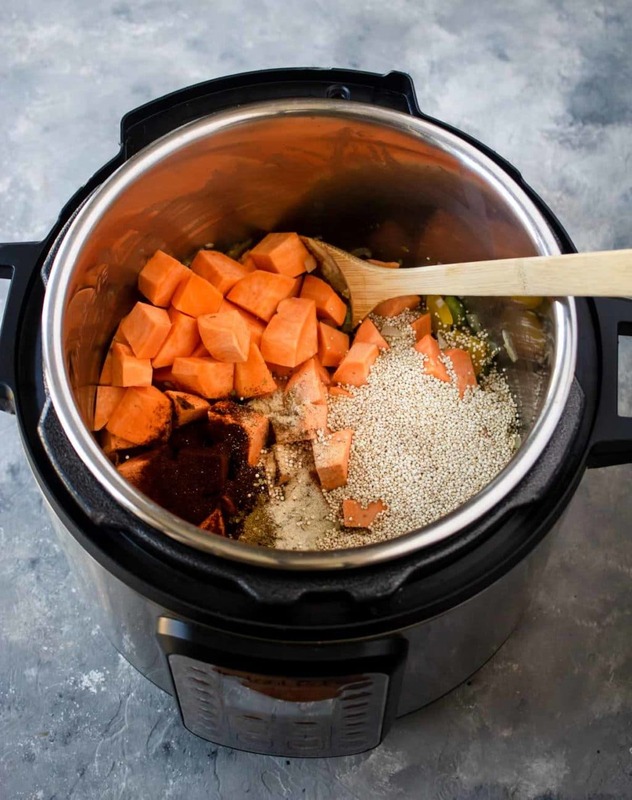 Bonus- it is cooks in just 5 minutes, such a great benefit of the Instant Pot! That is so much better than an hour or two on your stovetop, right?! 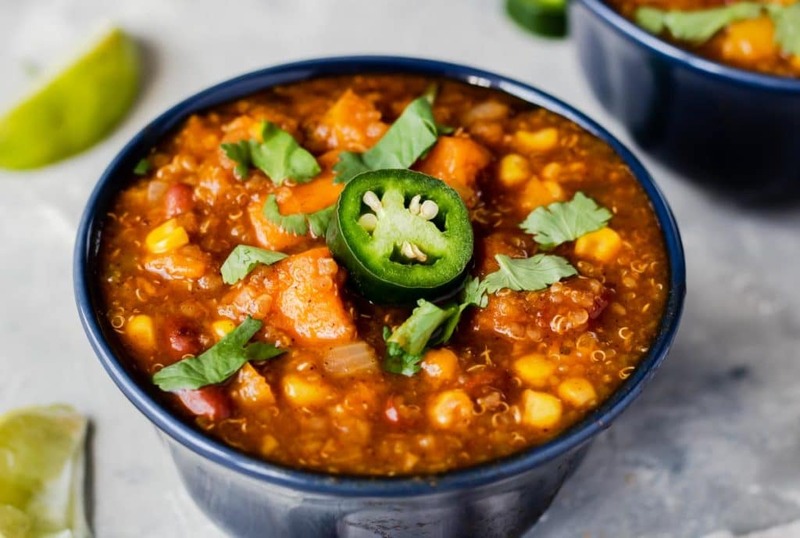 This quinoa chili has the perfect combo of flavors, it is a little sweet from the sweet potatoes, and balanced with savory onions, garlic and peppers, then the chili powder adds a nice warmth that you expect from chili. All-in-all the flavors are completely balanced, no one flavor overpowers the other. You can make this Instant Pot Chili ahead if you have a busy week you are prepping for. You can make it on a day when you have a little more time to spend in the kitchen, then store it in the fridge, in an airtight container, for up to 5 days. The flavors will deepen with time in your fridge! When you reheat it you may need to add a little water or broth as it will thicken as it sits in the fridge. I know a lot of Sweet Potato Chili recipes available are vegetarian. This one is not, but you certainly can make it that way! Simply swap the beef broth for your favorite vegetable broth. This Instant Pot Chili recipe doesn’t include any meat, like a classic chili recipe. However, you can definitely add meat if that is what you are looking for! 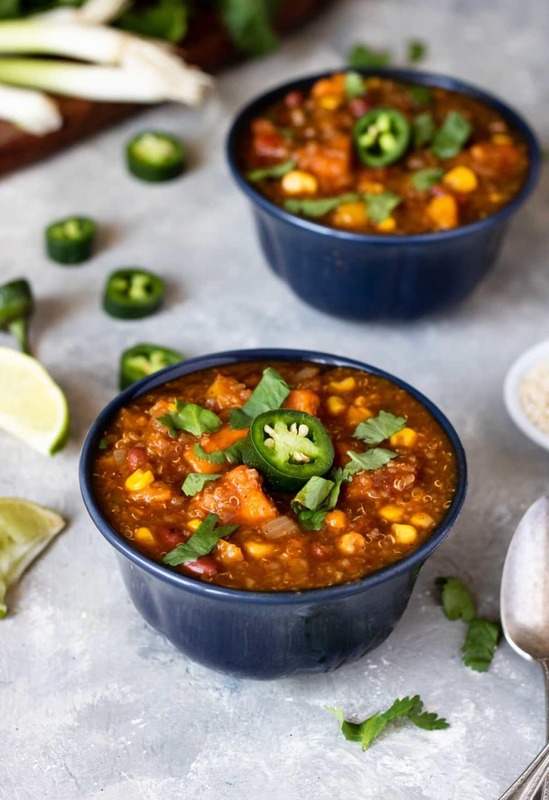 I recommend choosing a ground turkey (93/7), ground chicken, or ground beef (85/15) to compliment the flavors in this sweet potato chili recipe. When you saute the onions, celery, and garlic, add the protein of your choice and crumble while it cooks for about 5 minutes. Drain any excess grease and then proceed with the recipe. You may want to add a cup of water and and additional ½ tsp chili powder to the recipe to accommodate the extra ingredients. Start by setting your Instant Pot to saute, once it reads HOT, add the oil, onions, celery and garlic and soften for about 5 minutes. Stir in the can of green chilies and all the seasonings (chili powder, oregano, cumin, salt, garlic & onion powder). Now, turn the saute function off. Next add in the sweet potatoes, quinoa, beef broth, and chopped bell pepper. Stir it once, then pop the lid on and lock the pressure valve to “seal”. Set the Instant Pot to Soup mode or pressure mode, on high, for 5 minutes. Do a quick release by turning the pressure valve to “vent” at the end of the 5 minutes. Add the diced tomatoes (undrained), chili beans in sauce, frozen corn, and 1 tablespoon of honey. Give it a good stir and let it sit for about 5 minutes before serving. This give the beans and tomatoes a chance to warm thru and the honey to melt into the soup. It will also allow the soup to cool enough so it doesn’t burn your mouth!! 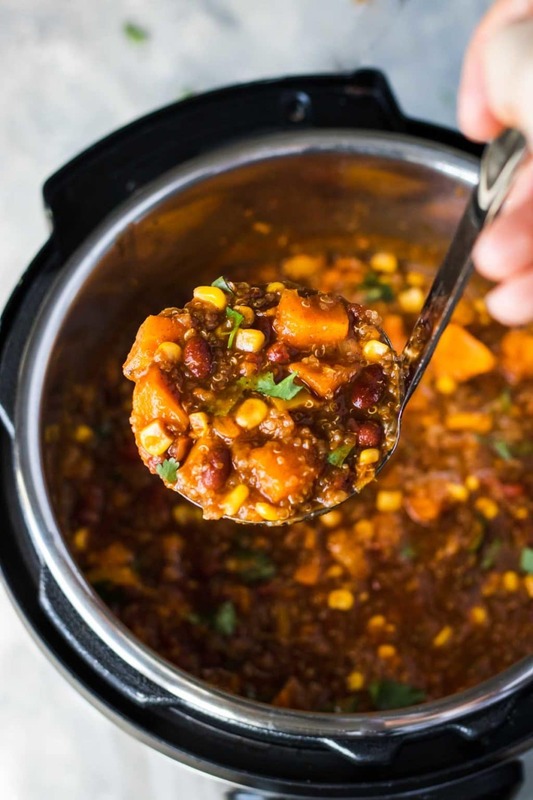 An amazing Instant Pot Quinoa Sweet Potato Chili Recipe with balanced flavors of sweet, savory, and spicy. This is a great unique chili recipe to add to your weeknight dinner plans. 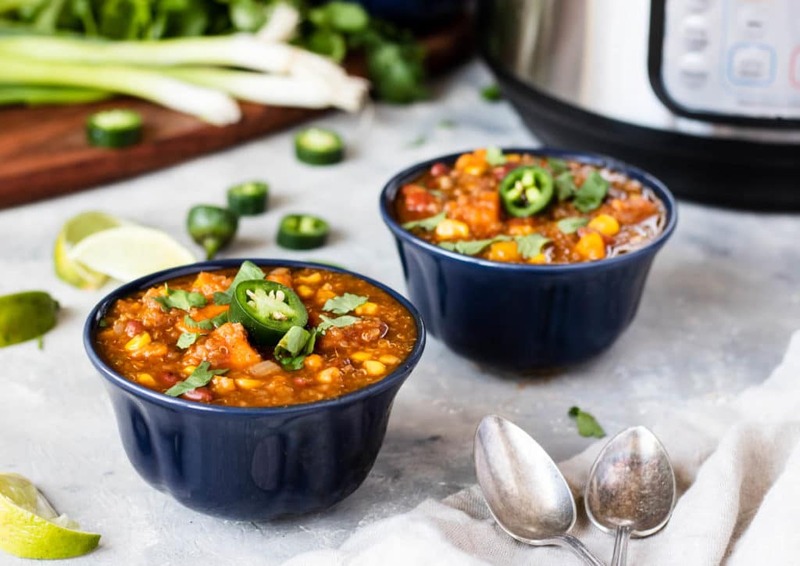 This Instant Pot Chili can be made ahead, made vegetarian, or you can add meat! pinch of ground clove a little goes a long way!! Turn the Instant Pot on to saute mode, once it reads HOT, add the oil, onions, garlic, and celery and soften for about 5 minutes. Stir in the green chilies and chili powder, cumin, oregano, garlic, onion powder, salt, and clove. Stir in the beef broth, sweet potatoes, bell peppers, and quinoa. Close the lid and lock the pressure valve to "seal", set the pot to soup mode or pressure mode, on high, for 5 minutes. Stir in the diced tomatoes, chili beans, corn, and honey. Let those added ingredients warm thru for about 5 minutes. To Make Ahead: Prepare completely and store in the fridge, in an airtight container for up to 5 days. To Reheat: Warm through in the microwave or on the stovetop. You may need to add a little broth or water, as it will thicken as it sits in the fridge. To Make Vegetarian: Simply swap the beef broth for vegetable broth. To Add Meat: You can add ground turkey (93/7), ground beef (85/15), or ground chicken. After sauteing the onions, garlic, and celery, add your preferred protein and cook for 5 minutes (crumbling while cooking), drain any excess fat/grease, then continue with the recipe as written. Add an additional 1/2 tsp of chili powder to flavor the additional ingredient. You may also need to add a 1/2-1 cup of water or broth at the end, depending how thick/thin you like your chili. I was skeptical upon hearing the name of this recipe but I am now a believer! This chili has a kick! Fresh jalapenos are a perfect topper! In five minutes?! That’s what dinner dreams are made of. 🙂 I love that you can add meat or leave it vegetarian. Will definitely hit our meal rotation this week! Awesome! You are going to love this. I love that you added in honey too! Cant wait to try this one! Thank you! It just needed something at the end to balance everything, honey did the trick!